I’ve fully mapped the wilderness of Sorpigal. Well, I mostly fully mapped it. It turns out, I forgot to mark the transition to the northern region in the northeastern part of the map, but I’ll correct that at some point in the future. In case, it was time to give the cave near Sorpigal a try. My two choices were to either take a look at what’s outside the city of Sorpigal, or to give the leprechaun a gem and teleport to some other random city. Technically, I could also use the portal in the dungeon, but the cave it leads to was still too dangerous. 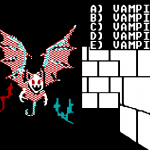 With Sorpigal fully mapped and a level gained, it was time to try my luck with the dungeon below it. Might and Magic doesn’t lead the player into the “next area” at all, but I figured the dungeon below the starting town should be OK for a level 2 party. 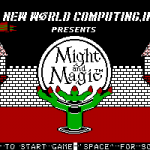 I actually had trouble figuring out how to start playing Might and Magic I – that’s how old the game is. Eventually, I managed to make a party and enter Sorpigal, the first town. It was time to die, a lot. I bought the Might and Magic Six Pack from GOG.com ages ago, so I figured it was finally time to give it a try. I was extremely worried about this and I was postponing it for months? Why? Because Might and Magic Book One: The Secret of the Inner Sanctum is almost as old as I am.